After a solid year of touring, in 2007, Chicago natives Flatfoot56 released this, their second album of brash Irish punk, reminiscent of the Dropkick Murphys or the Pogues. Jungle of the Midwest Sea includes Carry 'Em Out, City On a Hill, Warriors and more. 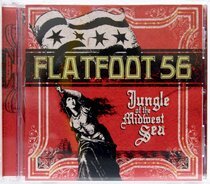 About "Jungle of the Midwest Sea"
Formed in 2000 by siblings Tobin (vocals/guitar), Justin (drums), and Kyle Bawinkel (bass), Chicago-based Celtic punk outfit Flatfoot 56 grew from a straight-up punk trio into a hard-hitting, Flogging Molly/Dropkick Murphys-inspired Oi! rock outfit with the additions of Highland piper Eric McMahon and mandolin/guitar player Brandon Good. The band released its debut album, Rumble of 56, in 2002 with Waves of War arriving the following year. 2004's Knuckles Up became the group's biggest seller yet, while 2007's Jungle of the Midwest Sea and 2010's Black Thorn helped to further cement their reputation as one of the genre's most spirited and electrifying champions.